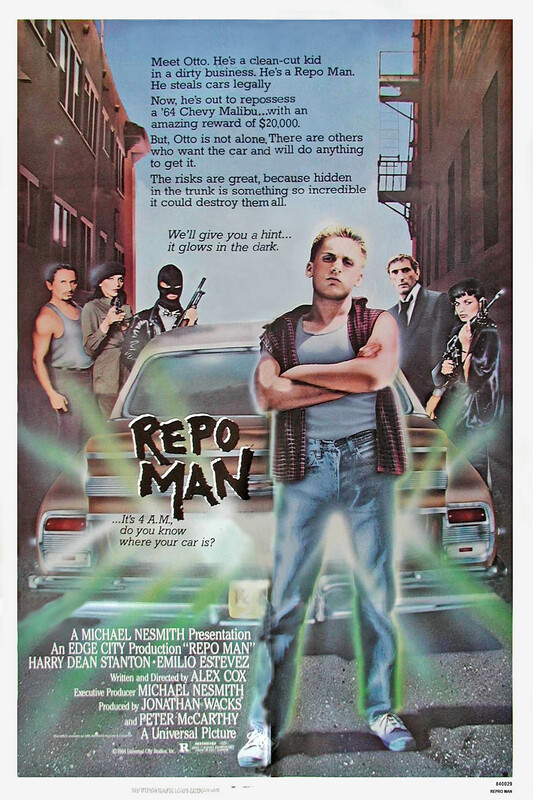 What It’s About: A chance encounter with Bud (Harry Dean Stanton) leads Otto (Emilio Estevez) away from his suburban punk lifestyle into a new career as a repo man. At the same time J. Frank Parnell (Fox Harris) is driving a car with…something…very dangerous and very much wanted by the government agents in the trunk. The huge reward on the car puts Bud, Otto, the rest of the repo men, and a whole cast of sleazy characters in pursuit of Parnell’s car. Why Watch it Today? : Project Blue Book, the U.S. Air Force program investigating reports of UFOs, officially closed its investigation today in 1969, without satisfying a signal one of its critics. Repo Man plays with the conspiracy lore surrounding UFOs and other government projects, while satirizing nearly everything about contemporary life in the most surreal fashion possible. This entry was posted in Aliens, Comedy, Espionage, Independent, Movie of the Day, Satire, Sci-Fi and tagged Alex Cox, children of famous people, covenience store robbery, Emilio Estevez, Harry Dean Stanton, homage, Iggy Pop, Michael Nesmith, Miguel Sandoval, punks, repo men, revolutionaries, robbery, robbery gone wrong, scientists, secret agent, secret military project, secret police, Sy Richardson, teens, televangelists, television, Tracey Walter, UFO, Vonetta McGee.